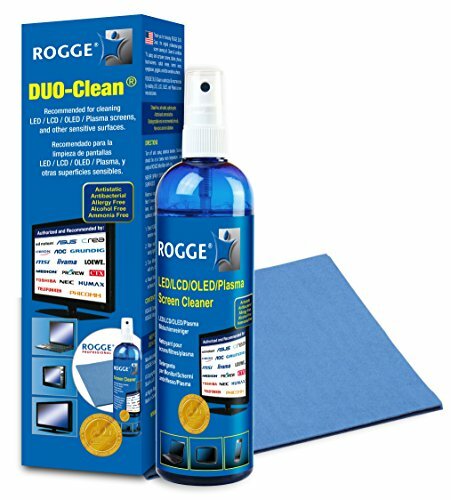 ROGGE DUO-Clean is a professional grade screen cleaning kit, including a Pump Spray and a optical-grade, washable Microfiber Cloth. ROGGE DUO-Clean works on all LED, LCD, OLED, Ultra HD, Curved and Plasma Flat TV screens, Computer, Cell Phone, display screens and sensitive surfaces. Cleans and removes grease, dust, oils, bacteria, fingerprints, smears and dirt - safely and efficiently. Heavily crusted or sandy soils should be removed first (with a brush or wipe). The included extra-large washable Microfiber Cloth is specifically designed for cleaning sensitive surfaces and also made in Germany. Streak-Free, Antibacterial, Natural, Antistatic, Allergy-Free, Alcohol-Free, Ammonia-Free, Biodegradable, Non-Toxic, Non-Abrasive and Non-Flammable. Conditions the surface by leaving a streak-free, anti-static, non-toxic and dust repelling finish. Does not contain any harmful or damaging substances. Authorized by leading manufactures: ASUS, AOC, ad notam, Crea, CTX, GRUNDIG, Hyundai, Humax, iiyama, LOEWE, MSI, MEDION, NEC, Proview, Smartbook, Toshiba, ORION, TELEFUNKEN, Phicomm. Optical grade, safe and easy to use. Certified and A+ rated by the German TUV. Engineered and Made in Germany since 1998. Pump spray bottle is Made in Italy. Natural, Streak-Free, Antibacterial, Antistatic, Allergy-Free, Alcohol-Free, Ammonia-Free, Biodegradable, Non-Toxic, Non-Abrasive and Non-Flammable. Removes grease, dust, bacteria, germs, oils, fingerprints, smears and other dirts with a few wipes. Ideal for all LED/LCD/OLED, HD, Curved, Plasma, Flat TV, Computer, iPhone, iPad, Cell Phone, Tablet, PC, macbook, Touch Screens. Works also great on sunglasses, eyeglasses, cameras, optical equipment and other sensitive surfaces. Authorized by leading manufactures: ASUS, AOC, ad notam, Crea, CTX, GRUNDIG, Hyundai, Humax, iiyama, LOEWE, MSI, MEDION, NEC, Proview, Smartbook, Toshiba, ORION, TELEFUNKEN, Phicomm. If you have any questions about this product by ROGGE, contact us by completing and submitting the form below. If you are looking for a specif part number, please include it with your message.